Changes to Serving Kids King Soopers Gift Card program have been announced and were implemented April 1st. In short – no more gift cards. The regular card you use for discounts is what you’re going to use (no loading money for purchase.) We are going to walk you through the process to make it really easy. Create an account with your email and a password of your choice. You can select whether to receive coupons and promotional emails or not. 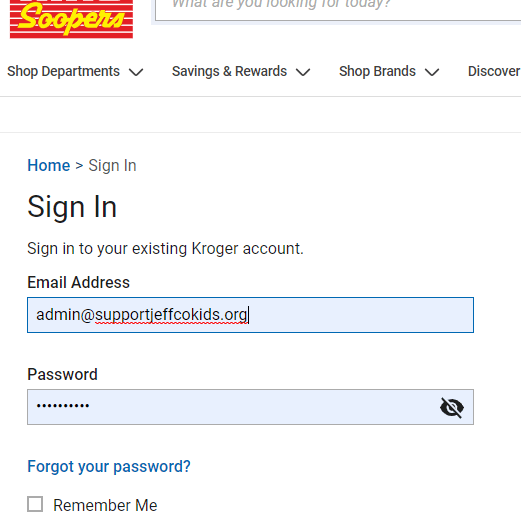 Then, under “My Account,” choose an organization for “Community Rewards.” Their number is RN170 but you can type in Serving Kids and it comes right up. We are asking you to make this happen for Serving Kids, they do so much for our neediest kids in Jeffco and really need those funds for new underwear, socks, and things not on their shelves. If you can’t figure it out and need help, email us at admin@supportjeffcokids.organd we’ll call you and help walk you through it. In addition to the gigantic number of clothing donations required by SK to meet the needs of Jeffco kids, we also must have funds for the new underwear and socks we give out or to purchase items not on our shelves at the time of a request. One program which has helped provide some of these funds has been the King Soopers reloadable gift card and, while we did not have a huge number of people using the cards, we were getting funds every month or two based on how much the users had purchased. We were hoping to increase the number of cardholders to increase the amount of funding and while we were working on that we received the news that King Soopers is changing the program to drop the use of the reloadable card as of April 1st and moving to use online accounts linked to a King Sooper’s Reward Card. The Reward card is the one many, if not most, of us have that we use to reap the benefits of sale prices and specials. Users either swipe the card in the reader or enter their linked phone number at “Alt ID” to confirm their membership in the program. The new Community Rewards program being instituted builds on the Reward Card membership and allows the card user to identify the community organization they would like to support through their purchases. The letter below contains information and links that will help you through the process of setting up an account if necessary or designating Serving Kids as the non-profit you wish to support. We sincerely hope that vast numbers of you will take advantage of this way to support our work without any additional funds from you. Serving Kids is run through the Jeffco Schools Foundation, they are separate from us and run by volunteers as well – retired Jeffco Schools teachers and principals. While they’re separate, we fully support what they do because they really Support Jeffco Kids – so we fully support them and will continue our clothing drives as well as drive info into the community to help them do their work.